Agrelo is where many of the better-known export-driven Argentine wineries are located. If there is a Napa in Mendoza, this would be it. Three long dirt roads lead south from Pedriel to Agrelo and Ugarteche and run parallel to the Ruta 40. All the area wineries are located along Route 15, Cochabamba and Cobos streets. The roads are pitted with potholes, wild dogs and cats run free, you'll see more than a few horses leashed to a tree by the road with no owner in sight, and unhelmeted bikers of all ages ride the roads-so drive slowly. Sparsely populated Agrelo has a simple country charm, with mostly dirt roads and scattered white adobe and brick houses that are common throughout Mendoza. You won't find shopping malls here-only some of the biggest names in Argentine wine. It will certainly surprise you to see a pyramid rising out of the vineyards in Agrelo. No you're not in the Mayan ruins of Guatemala, but have arrived at Bodega Catena Zapata, the Catena family winery. 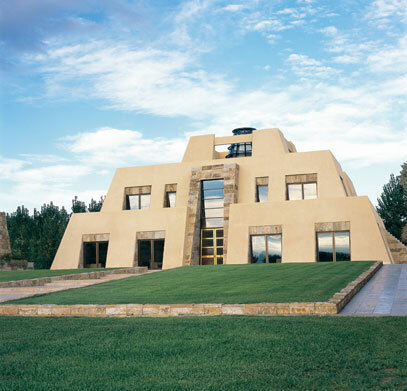 Inspired by the great temple of Tikal, Nicolas Catena and his daughter Laura chose this architectural style as a reflection of the distinct, New World terroir of Mendoza. Notice the local stone used in the winery's construction. The Catena family has been making wine in Mendoza for more than 100 years. Over the past 25 years, Nicolas Catena, third generation family vintner, has been on a quest to discover the quality potential of this high altitude desert oasis. He is joined by his daughter Laura, an emergency room physician at the University of California San Francisco, who as head of the winery's Research & Development program, is conducting an exhaustive investigation into the unique character of the family's high altitude Malbec vineyards.